As yoga’s popularity inflates, so does the number of yoga classes or styles. The range of styles can be overwhelming, especially if you’re a new student. Every style of yoga has its own challenges and the main difference from style to style is in pace, intensity, and degree of spirituality and there’s even a diversity in teaching approaches within each discipline. If one yoga style doesn’t suit you, there will be others that surely will. This article will help you to get an overall idea of most popular types of yoga classes and to decide your method of a class you love. Hatha is a very wide-ranging term that can include many of the physical types of yoga. If a class is portrayed as Hatha style, it is most likely going to be slow-paced and gentle that provides a good introduction to the basic yoga poses. Hatha is an excellent style for beginners. You will learn terminology, relaxation techniques and basic poses that you will find in almost every other style of yoga. You don’t have to be fit, young, or flexible. You can begin from where you are at this moment and can start within your own level of comfort listening to your own body’s messages. 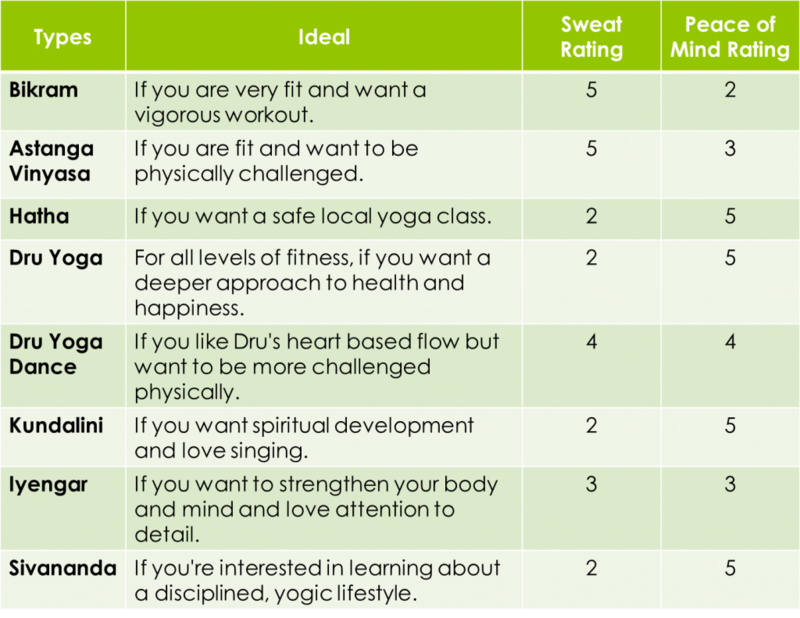 Comparable with Hatha, Vinyasa is also a wide-ranging term that is used to illustrate many different types of classes. Vinyasa, which indicates breath-synchronized movement, predisposed to be a more spirited style based on the performance of a series of poses known as “Sun Salutations”, in which movement is matched to the breath. Vinyasa is also called “Flow”, in reference to the continuous movement from one posture to the next. A Vinyasa class is great to start your yoga journey and to continue challenging yourself. If you love to focus on the intensity of breathing and flowing movement throughout poses, you will definitely enjoy this style. Based on the trainings of the yogi B.K.S Iyengar, it is most concerned with bodily alignment. This practice usually emphasizes grasping poses overlong period opposed to moving quickly from one pose to the next (flow). Also, it encourages the use of props, for instance, yoga blankets, blocks and straps, with the intention of bringing the body into alignment. Iyengar Yoga is suitable for all people of all ages, abilities and shapes. One does not need to be flexible or fit to begin this style of yoga. If someone is restricted by age or a previous injury then this style of yoga will be gentle enough for his or her needs. “Ashtanga”, which stands for “eight limbs” is a fast-paced, extreme style of yoga. Here, a set series of poses is acted upon, always in the same order. This training is very physically demanding because of the unvarying movement from one pose to the next and the emphasis on daily practice. Ashtanga is also the motivation for what is often called Power Yoga, which is originated on the flowing style of Ashtanga without carrying on strictly to the set series. You have to be fit, strong and flexible enough to practice Ashtanga Yoga. Lead the way by Bikram Choudhury, this style is more commonly branded as Hot Yoga. It mainly focuses on loosening of tight muscles and bountiful sweating, which is thought to be a refinement. The Bikram method is a set series of 26 poses, however; not every hot class makes use of this series. It is madly popular and one of the easiest types of classes to find. If someone wants an intensive yoga experience that incorporates a comprehensive yoga workout with a yoga studio heated up to 105 degrees than Bikram is probably what he/she is looking for. The prominence in Kundalini is on the breath in combination with physical movement, with the purpose of releasing energy in the lower body and letting it to move upwards. Most of the practices make use of controlling the breath, in contrast, the exploration of the effects of the breath on the postures is essential in Kundalini. This exercise is also known as Kriyas. The Kundalini Yoga has developed in a way which assures that the starting process is safe and gentle, even for people who are compelled to work from books or live in areas where there are no teachers available. In fact, if you can move your body or can breathe, you can do Kundalini Yoga. Anusara is an incorporated approach to hatha yoga in which the human spirit intermingles with the defined science of biomechanics. It’s an innovative coordination of hatha yoga that can be both spiritually stimulating and yet stranded in a deep understanding of outer and inner body alignment. It can be therapeutically effectual and bodily transformative. This style of Yoga distinguishes itself from other hatha yoga styles with three significant areas of practice: Attitude, Alignment and Action. This style of yoga came to light from one of New York’s paramount yoga studios. Jivamukti founders David Life and Sharon Gannon were inspired by the inflexibility of Ashtanga yoga, in combination with tuning, meditation, and spiritual teachings. They trained many trainers who brought this style of yoga to studios and gyms, mostly in the U.S. These classes are physically concentrated and often include an inspirational theme chosen by the teacher. So if you were waiting for the perfect time to learn more about Yoga class, the time is now. Join us now and start learning today.